Pancreatic cancer is a devastating malady with proclivity for early metastasis, accounting for its poor prognosis. Pancreatic ductal adenocarcinoma, the most common type of pancreatic malignancy, exhibits an over-expression of several growth factors such as epidermal growth factor and transforming growth factor beta, which correlate with a decrease in patient survival. These growth factors as well as hypoxia-reoxygenation conditions have been shown to increase pancreatic tumor cell invasiveness. 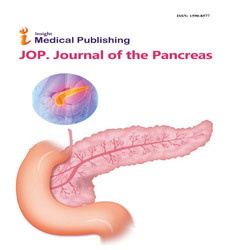 This review will focus on the signaling pathways used by these distinct microenvironmental factors to promote extracellular matrix degradation and invasion by pancreatic tumor cells. Intraductal papillary mucinous neoplasm (IPMN) is an important precursor of ductal adenocarcinoma . We report a case of recurrence of IPMN as a pancreatic ductal adenocarcinoma, following surgical resection of IPMN after two years. We can see the serial change of trivial benign looking cyst to definite IPMN. A 69-year-old woman was admitted to operate a pancreatic mass. She had a history of hepatocellular carcinoma, and underwent hepatectomy in 2003, therefore followed regularly by abdomen CT scan. A small benign looking cyst appeared in the CT scan on 2007, and remained unchangeable until 2009 (Figure 1 A-C). However, it grew slowly and in March 2011, a pancreatic mass located at the tail became larger (up to 2cm sized) and caused prominent dilatation of the pancreatic duct, suggesting combined type IPMN (Figure 1 D-F). She was taken distal pancreatectomy with splenectomy in May 2011. Pathologically, it was a 1.5cm sized IPMN with high grade dysplasia. The resection margin was free of tumor and the distance was 0.5 cm. Figure 1. 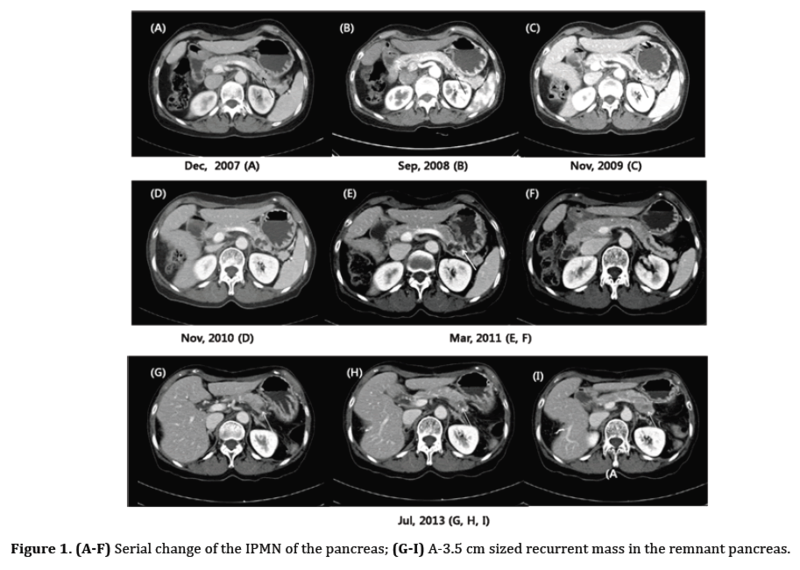 (A-F) Serial change of the IPMN of the pancreas; (G-I) A-3.5 cm sized recurrent mass in the remnant pancreas. On the follow up CT scan taken 26 month after operation, 3.5cm sized mass in the distal remnant pancreas appeared (Figure 1 G-I). It was suspicious of recurrence of IPMN. She was operated to remove remnant body of pancreas. It was a multilobulated ill-demarcated whitish mass, measuring 3.4x3.2x2.6 cm. It was 5 cm apart from proximal pancreatic resection margin. It was an IPMN with an associated a poorly differentiated adenocarcinoma. Depth of invasion was peripancreatic tissue and lymph node metastasis was not detected. The patient recovered without complication. Ductal adenocarcinoma developed in 4.5 to 8% of branch duct IPMN during follow up [2, 3]. Since patients with pancreatic IPMN are at a risk of developing recurrence and pancreatic ductal adenocarcinoma in the remnant pancreas, early recognition, treatment, and long term surveillance are important [2-4].